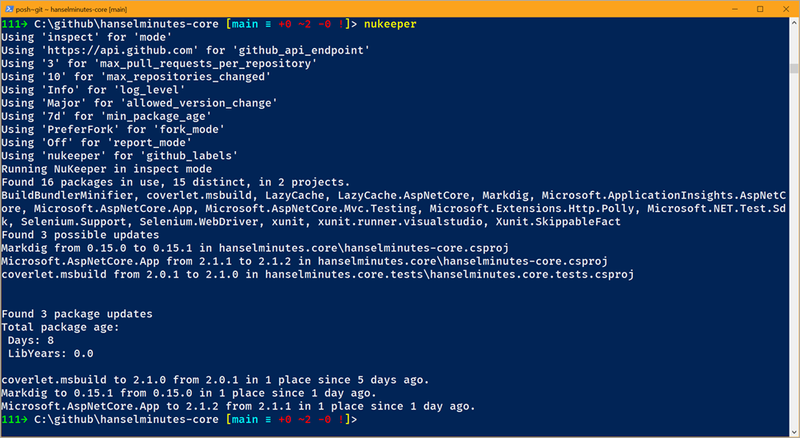 Last week I looked at “dotnet outdated,” a super useful .NET Core Global Tool for keeping a project’s NuGet packages up to date. Since then I’ve discovered there’s a whole BUNCH of great projects solving different aspects of the “minor version problem.” I love this answer “Why?” from the NuKeeper (inspired by Greenkeeper) project with emphasis mine. NuKeeper will check for updates AND try to update your references for you! Why not automate the tedious! NuGet package updates are a form of change that should be deployed, and we likewise want to change the cycle from “NuGet package updates are infrequent and contain lots of package changes, therefore NuGet package updates are hard and dangerous…” to “NuGet package updates are frequent and contain small changes, therefore NuGet package updates are easy and routine…”. Certainly no one is advocating updating the major versions of your dependent NuGet packages, but small compatible bug fixes come often and are often missed. Including a tool to discover – and optionally apply – these changes in a CI/CD (Continuous Integration/Continuous Deployment) pipeline can be a great timesaver. Why do we deploy code changes frequently but seldom update NuGet packages? Looks like three of my packages are out of date. NuKeeper shows what version I have and what I could update to, as well as how long an update has been available. You can also restrict your updates by policy, so “age=3w” for packages over 3 weeks old (so you don’t get overly fresh updates) or “change=minor” or “change=patch” if you trust your upstream packages to not break things in patch releases, etc. NuKeeper is picking up steam and while (as of the time of this writing) its command line parameter style is a little unconventional, Anthony Steele and the team is very open to feedback with many improvements already in progress as this project matures! The update functionality is somewhat experimental and currently does 1 update per local run, but I’m really enjoying the direction NuKeeper is going! 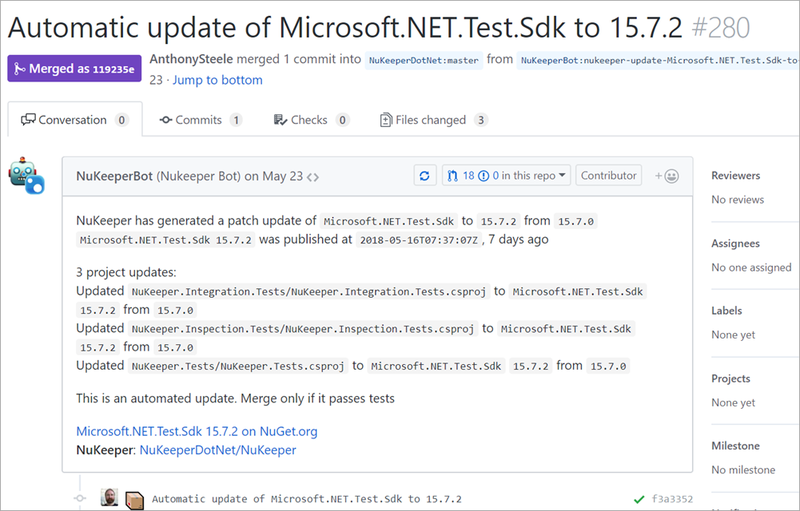 NuKeeper has a somewhat unique and clever feature called Repository Mode in that it can automatically issue a Pull Request against your repository with the changes needed to update your NuGet references. Check out this example PullRequest! Again, it’s early days, but between NuKeeper and “dotnet outdated,” I’m feeling more in control of my package references than ever before! What are YOU using?